I went to visit my friend Deola who cooks so well! She made me so much food the whole kitchen smells like a Nigerian ‘Bukka’, I’m currently eating some Jollof rice, Moi-moi, and Chicken with a cold glass of juice! Gotta love Deola. 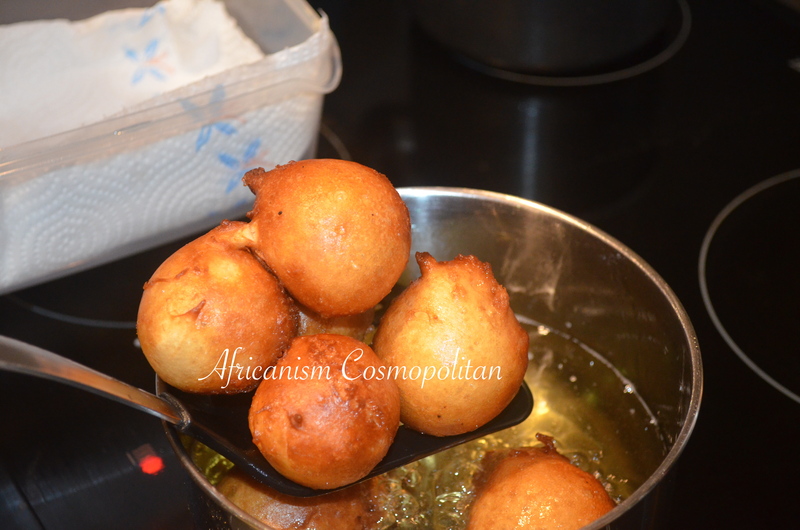 Anyway last night she made some puff -puff because we were craving, so I filmed the process for you lovelies ! Step 1: Pour active yeast into a bowl and add warm water. Step 2: Add adequate sugar into the mix. Step 3: Add flour to the mix and ensure it has a thick, creamy and smooth consistency. Step 4: Cover mix for an hour or more and leave to rise, If you’d like it to rise faster, place the bowl into hot water to generate more heat. Step 5: place oil into a pot and heat up. Step 6: Scoop paste into the oil and fry for about 4mins, move puff-puff around to avoid them sticking to each other.